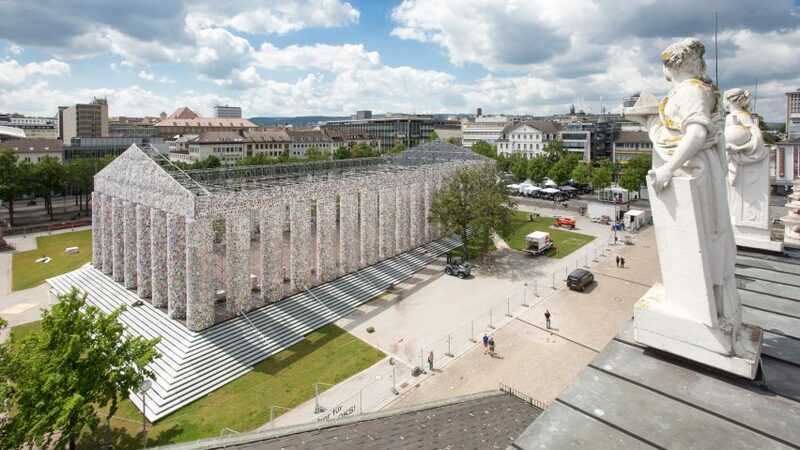 Argentinian artist Marta Minujín has used thousands of prohibited books to construct a replica of the Parthenon in Athens on a Nazi book-burning site in Kassel, Germany. Taking a stance against censorship, Minujín designed the Parthenon of Books to echo the classical Greek temple, which remains a major icon of the democratic Athenian polis. Metal scaffolding mimics the form of the temple, which is then covered in books held by plastic wrapping. All the books were donated by the public from a shortlist of over 170 titles that are either currently or formerly prohibited. Also emphasising Minujín's motivation is the chosen site of Friedrichsplatz Park, where Nazi sympathisers burned an estimated 2,000 prohibited books on 19 May 1933. The installation forms part this year's Documenta 14 art festival in Kassel, a city in the north of central German state Hesse. It responded to a brief that asked contributing artists to explore the relationship between Kassel and Athens – the festival's partnering city. But this is not the first time that Minujín has created the Parthenon of Books. The artist also constructed a replica in Buenos Aires, choosing books banned during Argentinian military dictatorship from 1976 to 1983. It opened just one week after the restoration of democracy on 19 December 1983, and the following week it was tipped over by two cranes to allow the public to take the books they wanted. A similar distribution of the books is planned for the end of Documenta 14, although details are not yet confirmed. Minujín also teamed up with the University of Kassel and professors Nikola Roßbach and Florian Gassner to compile a list of books that are currently forbidden in various locations around the world. Book burnings took place in cities across Germany in 1933 as part of the Aktion wider den undeutschen Geist, which translates as a Campaign against the Un-German Spirit. Organised by the German Students Union, the events were intended to bring arts and culture in line with the Nazi ideals and rid blacklisted authors from circulation. Mass burnings were scheduled to take place on 10 May 1933 but Kassel's was delayed due to rainfall. Last year, a replica of the Palmyra Arch was been erected in London's Trafalgar Square. The 2,000-year-old Syrian architectural landmark believed to have been destroyed by Islamic militant group ISIS. Photography is by Roman Maerz.